At a roadside restaurant on the banks of the Guadalquivir, not far from Sevilla, my friends and I ordered the menu del día, a fixed-price meal consisting of primer plato (starter), segundo plato (main dish) and postre (dessert) for €8.50 (about $9.20). There were a couple choices for each course. For the primer plato, we chose albondiguitas de pescado, fish balls. Served in shallow bowls with sauce and bread to go with, they were four or five small balls, nicely seasoned, very tasty. I asked the cook for the recipe. 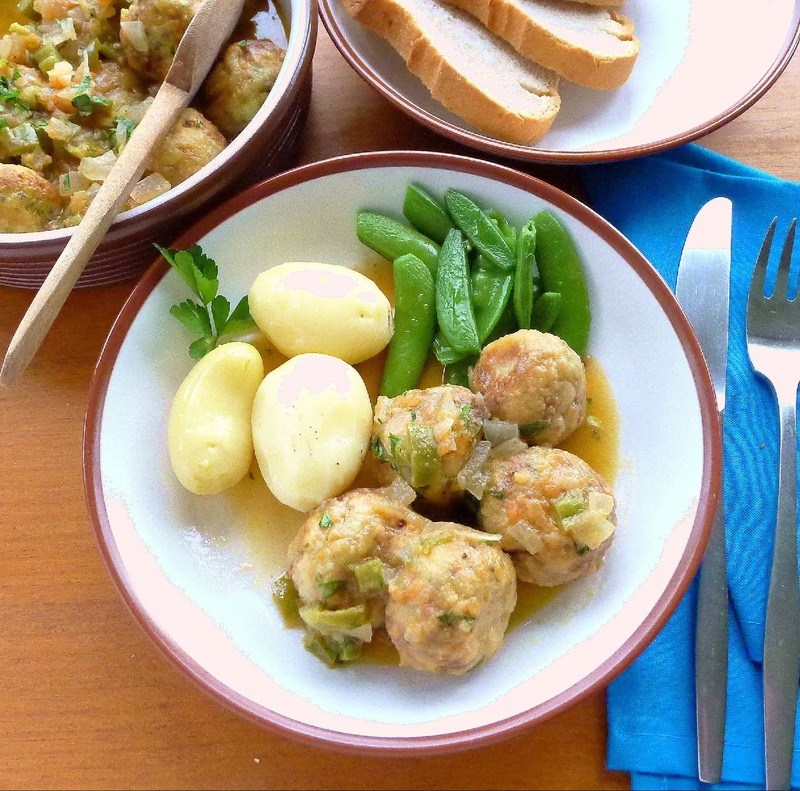 Fish balls in sauce--a Spanish dish that dates from medieval times. 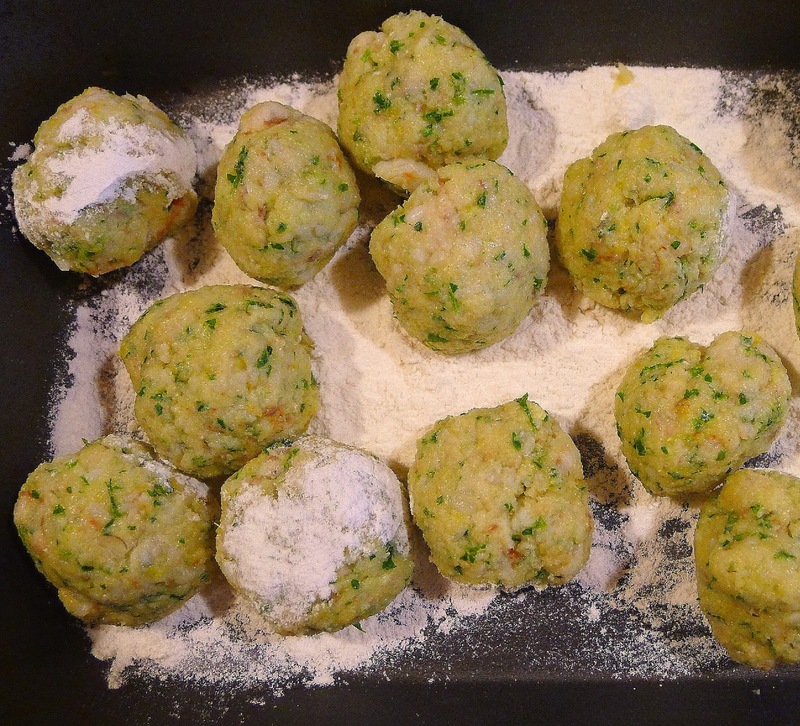 I later discovered almost the identical recipe for albóndigas de pescado in Sephardic (Jewish) cookbooks. Sephardic cooking originated in medieval Spain, when Jews lived in many parts of the Iberian peninsula along with the Moorish (Arab) overlords. The word “albóndiga” comes from the Arabic al-bundaq, meaning “round.” Albóndigas is the word for either fish or meat balls. 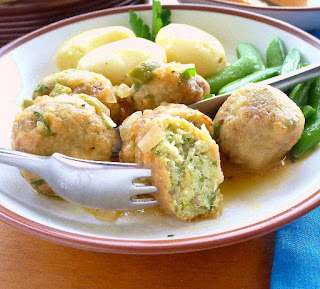 The fish balls are also a good way to use leftover cooked fish. Use about 2 cups flaked, cooked fish and leave off the poaching step. My current favorite fish is corvina. (More about corvina here.) Because it is farmed in Spain, the fish is reasonable in cost. I cut two fillets from the lomo, thick center section, for grilling and save the skinny tail ends and thick “belly” section with rib bones for making these fish balls. Once the bony pieces are gently poached, it’s easy to remove any remaining skin and bones. After frying, the fish balls can be served as a tapa. 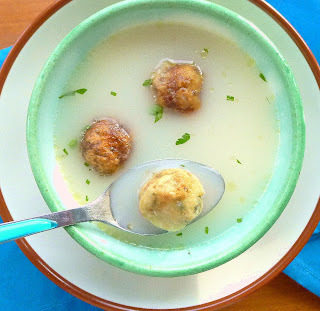 Add fish balls to soup with cooked rice and peas. Serving ideas. 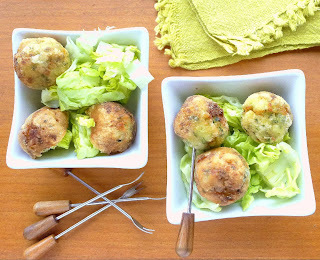 Make small fish balls (marble-sized) and serve them, without the sauce, as a tapa. 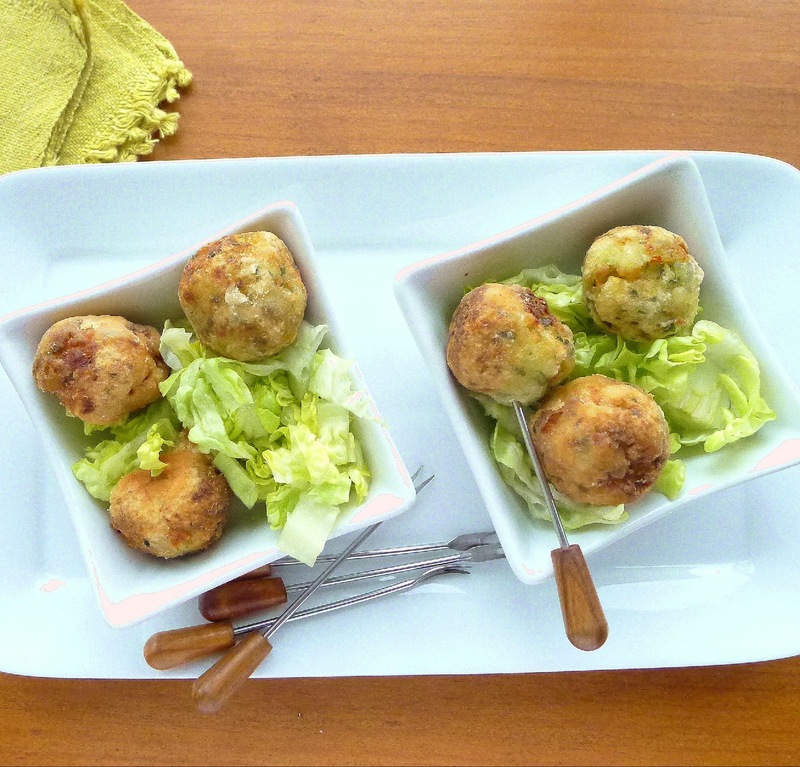 Accompany the fried balls with a garlicky alioli. As a starter, they’re good with bread for mopping up the sauce. 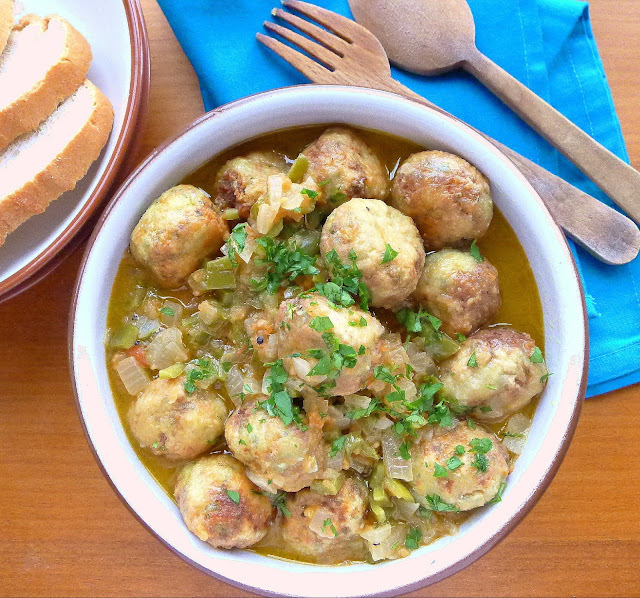 If you’re serving them for dinner, make walnut-sized balls and accompany them with steamed white rice, pasta or potatoes. At my house, kids like fries with the albóndigas. Remaining broth from poaching the fish can be saved for fish soup. Add any leftover fish balls to the soup. Fish balls in sauce on the dinner plate, with new potatoes and snap peas from the garden. If you’re starting with fish that has some skin and bone, use about 20 ounces fish, as some will be discarded. Makes 16 fish balls or 32 small ones. After poaching, it's easy to remove bones. 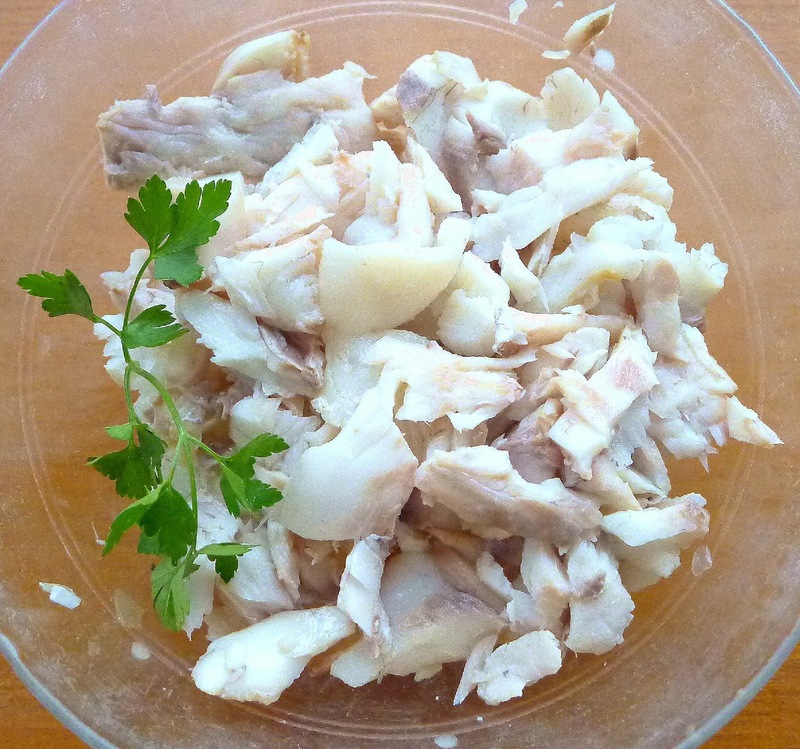 When fish is cool enough to handle, flake or chop it, discarding any skin or bones. Pour the milk over the bread slices in a small bowl and allow to soak for 10 minutes. 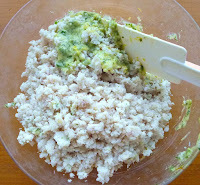 In a food processor finely chop together the garlic and parsley. Squeeze out excess liquid from the bread. Add it and process until bread is fairly smooth. Add the saffron, if using, ½ teaspoon salt, lemon zest and egg and process to blend. Place in a bowl. Add the flaked fish to the processor and pulse several times just to chop it. 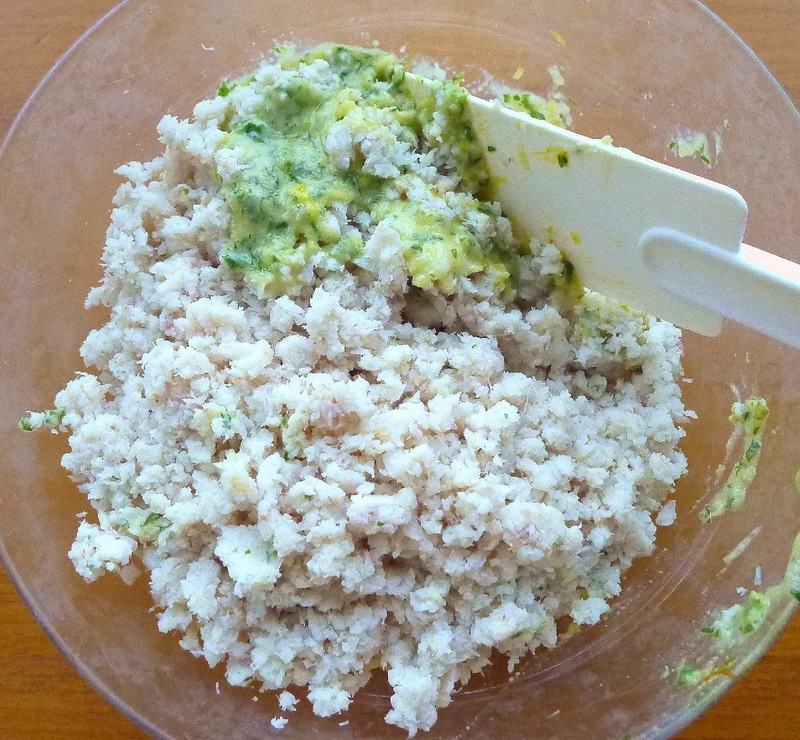 Combine the fish with the bread mixture. Refrigerate the fish mixture, tightly covered, at least 30 minutes and up to 8 hours. Mix chopped fish with bread. Place the flour in a shallow pan. 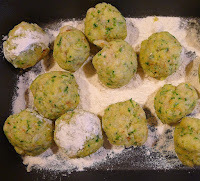 Shape the fish mixture into 1 ¾ -inch balls (or small ones, half that size) and place them in the flour. Roll the balls to coat evenly with flour. Roll fish balls in flour. Add enough oil to cover the bottom of a large frying pan. Heat the oil and fry the fish balls, in two or three batches, turning them to brown on all sides, about 5 minutes total. Remove them as they are browned. After frying, fish balls are ready to serve. Or, reheat them in the sauce. For the sauce: Heat the 3 tablespoons oil in a clean frying pan. Sauté the chopped onion and green pepper on medium heat for 5 minutes. Add the tomato and fry on a high heat until tomato sweats out its liquid, about 5 minutes. Add the wine and reserved strained fish broth. Season with salt and pepper. Bring to a boil, cover and simmer 20 minutes. Add the fish balls to the sauce and reheat gently, about 8 minutes. Sprinkle with chopped fresh herbs to serve. Fish balls are light, juicy. More recipes for meatballs and fish balls. 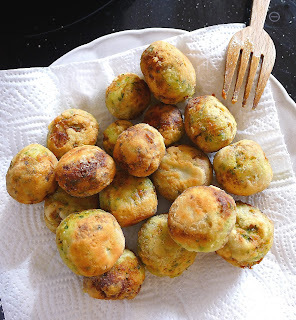 Recipes for alioli to accompany fried fish balls: http://mykitcheninspain.blogspot.com.es/2015/03/rice-on-side.html and http://mykitcheninspain.blogspot.com.es/2010/02/jug-of-olive-juice.html.